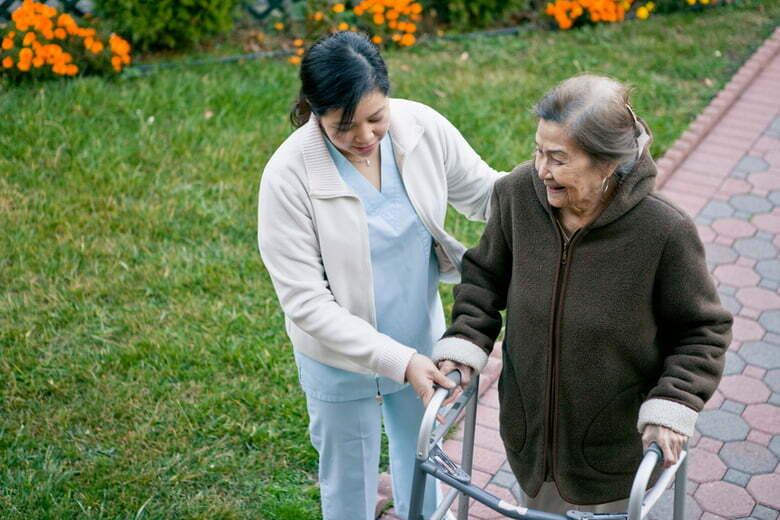 The demand for in-home senior care is growing rapidly across the country. Care.com identified 20 cities that are seeing the fastest job growth. The “silver tsunami” is already here: Baby Boomers are turning 65 at a rate of 10,000 people per day. The number of Americans aged 65 and over will nearly double in the coming decades, from 43 million in 2012 to nearly 84 million in 2050, when they’ll comprise 20 percent of the total population. Who will take care of them as they get older? Today, some 34 million family caregivers provide roughly $500 billion in unpaid care to their aging loved ones—but, as the aging population grows, experts warn there won’t be enough family caregivers to go around. Still, nine in 10 seniors say they’d prefer to remain in their home and “age in place” — a trend that many in the healthcare industry are counting on to help reduce the costs of expensive long-term care. To help keep seniors well cared for, safe and healthy in their homes, seniors and their families are hiring more in-home care to provide assistance with everything from hands-on care to housekeeping, meal prep, transportation to and from appointments, and errand-running. In fact, some U.S. cities are already seeing that growth now. 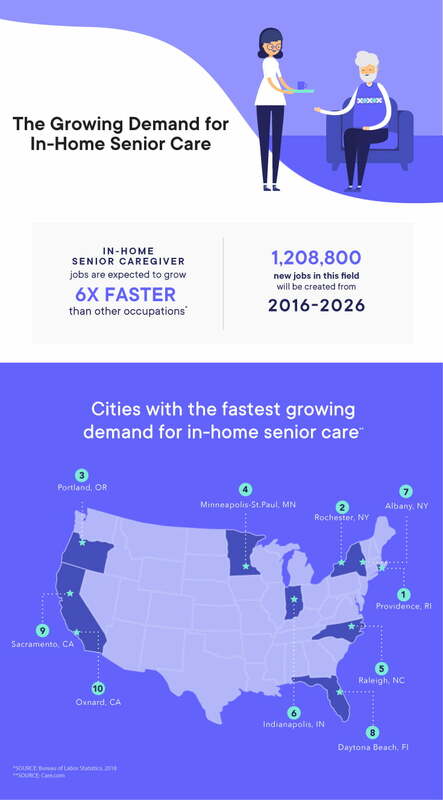 A new analysis by Care.com crunched the numbers to identify which U.S. cities are seeing rapid growth for in-home senior care jobs, based on annual job growth numbers over a five-year span from 2012 to 2017. Then, we compared each city’s compound annual growth rate (CAGR) against the national average in order to rank them by where demand is growing the fastest. As you can see, Providence clinched the top spot on our list of areas with the fastest job growth for in-home senior care. Since 2012, the number of jobs in that area has increased more than five times over. Rochester, NY is right on Providence’s heels, with almost five times more jobs in 2017 than in 2012. Portland, Minneapolis, and Raleigh round out the top five markets for fastest-growing in-home care jobs in the United States. So, what does this all mean? If you’re a caregiver—or thinking about becoming a caregiver—these 20 markets may offer you some of the best opportunities for a career in home health. We also found that in more than half of the top 20 cities with fastest-rising job growth, wages were growing faster than inflation—often much faster. That bucks recent national trends, which have shown average wage growth being wiped out by rising costs of living — with “real wages,” on average, staying flat. How to find the right in-home senior care job for you? Care.com is the world’s largest online platform for family care. If you’re thinking about a career in senior care, start with Care.com’s Professional Guide for Senior Caregivers to learn about pay rates, caregiver duties, interviewing, and more. Then browse for in-home senior care jobs near you. Care.com data analysts pulled data from 30 metropolitan statistical areas (M.S.A.) in the United States with the highest in-home senior care job Compound Annual Growth Rate (CAGR) from 2012 to 2017. A higher CAGR (i.e. higher compound job growth) results in a higher ranking. For these same 30 MSAs, analysts also calculate the CAGR for average hourly in-home senior care wages. I just moved from Nashville and agencies have popped up like weeds there! The pay there and in the south is extremely low. Its not a living wage. There's a lot of 2 hour cases also most with no mileage reimbursement. Care.com should show pay wages in various states. I met a fellow caregiver (guy) who had just moved there from another state ( can't remember but wealthy) who said multiple caregivers shared apartments because the cost of living was extremely expensive and they would drive great distance back home on off days to see their family despite their good pay!